Clouds above Sedona rock formations glow in sunset light. My last two posts showed the beauty of a Sedona sunrise, while today’s post puts a Sunset on exhibit. When reality disappoints, the artist creates their own. The light on the rock formations at the bottom of the image happened a good 20 minutes before the clouds above started to glow. The position of the clouds to the west prevented good light from hitting both land and sky at the same time. I was fortunate in not giving up after the light on the rock formations faded, so my camera was still in position to capture the glowing clouds when they started their show. It was simple enough to combine the images together to create the scene I had hoped would develop naturally. Captured with a Nikon D800 and a Sigma 50mm f/1.4 Art lens, the clouds were captured in 3 vertical images and formed into a collage. The ground image was made with a single image. The results were collaged together to create the image you see here. I hope you like it. 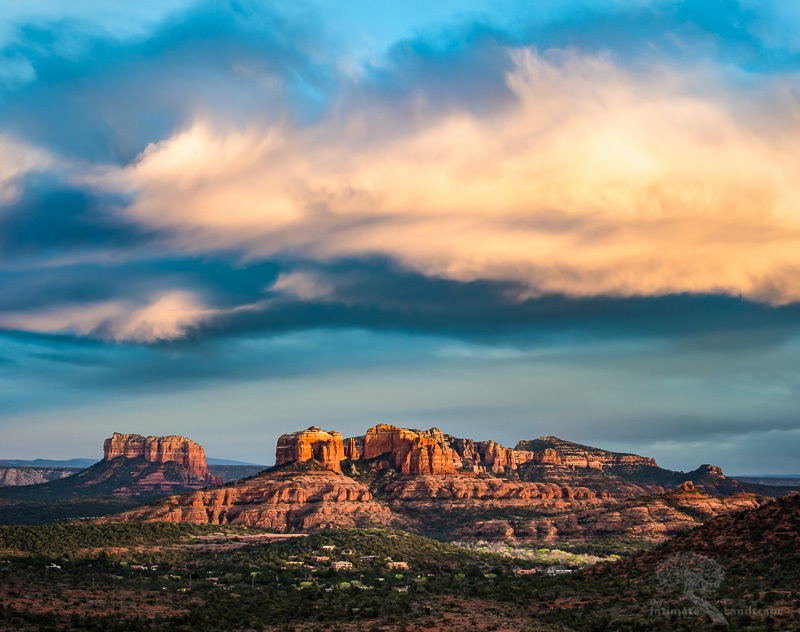 This entry was posted in Landscape Photography, Southwest, technique and tagged Arizona, clouds, dramatic, glow, red rocks, Sedona, sunset.